1. A certified PADI Instructor “Howard” just for you. 2. A certified PADI Divemaster “Rhonda” just for you. 3. Private lessons just for you. 4. We will teach private lessons to two people at the same time if both of you want to learn together, such as you and your brother, sister, daughter, son, spouse, friend, etc..
5. You will not be diving with a stranger you just met at the class. 6. As much as possible we avoid the overcrowded dive sites and prefer the sights and sounds of nature above the roar of the crowd. 7. Our classroom sessions are comfortable and enjoyable. 8. The pace of the class will be set according to your abilities and comfort level, not according to some busy training schedule. Where you progress quickly we will move quickly, where you need a little more time we will take more time. 9. As you can see on our website “HandRscuba.com” we go the extra mile for our students with extras such as photos to share your experience with your family and friends. 10. After completing the course we often have a few nice surprises for our students such as a certificate of completion suitable for framing to display on your wall, and other gifts. 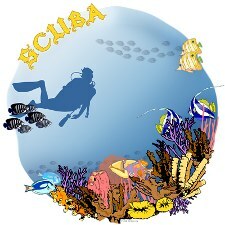 Taking a scuba course with H&R SCUBA is about much more than just learning to scuba dive. It is a great confidence builder and a very important milestone in your life. As a Scuba Instructor I have seen fear changed to courage, faint heartedness converted into accomplishments, timidity transformed into confidence, and anticipation turned into passion. It is a great way to open your heart and mind to the hidden beauty of nature’s creation. The underwater world is like visiting a whole different planet. Many have found that learning to Scuba Dive has transformed them and changed their life for the better and forever.